Guest photographer today! 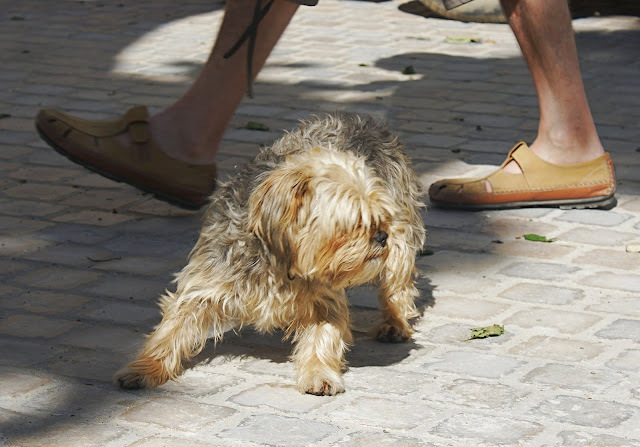 John Carroll follows Riviera Dogs and kindly sent me this photograph taken in Peyriac de Mer - not technically the Riviera but in France and on the Mediterranean so we'll cheat and call this little Yorkie a Riviera Dog. Peyriac de Mer is in the Languedoc-Roussillon. Don't you love the mixture of feet here and John's title. Take a look at talented photographer, John's website Winding Road Photography. Thanks John.